Nicholas Kirkwood debuted his Spring/Summer 2015 women’s footwear collection during Paris Fashion Week. For the first time, the House presented its creations outside London, choosing the Hôtel du Grand Veneur as the venue. The collection, entitled Lucid Plains, features shoes with layered materials, bold and explosive colors and abstract floral patterns. The designer merges gold, printed leathers and satin to revisit his iconic pumps. The signature Origami model is decorated with an outsized pastel leather ribbon. 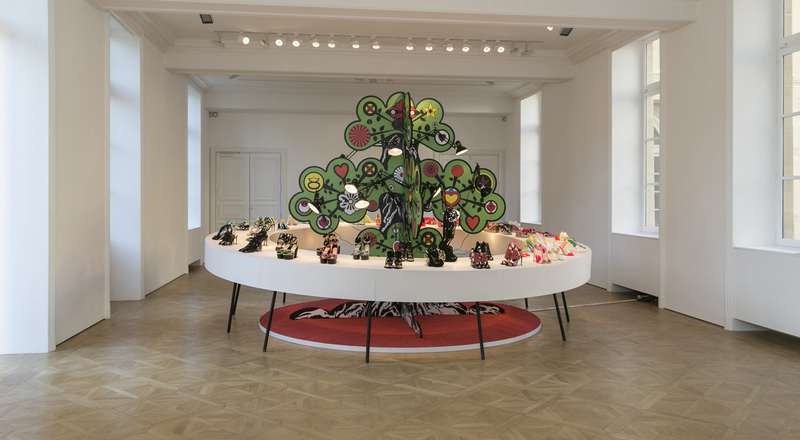 The collection was presented in a salon at the Hôtel du Grand Veneur in Paris on a large display in the form of a psychedelic tree. This striking composition resonated with the designer’s inspirations, notably 60s and 70s pop art and Japanese artist Tadanori Yokoo.